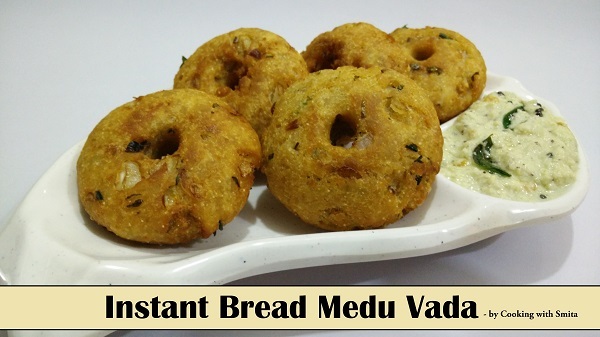 Instant Bread Medu Vada is a very delicious Vada recipe made from Bread Slice, Rice Flour, Semolina & spices. Usually, Medu Vadas are made with Urad Dal batter which requires soaking, but this Bread Medu Vadas cane be made instantly in just 15 minutes. Learn how to make this Instant Medu Vada with this step-by-step guide. Crumble bread slices into small pieces, add Curd, Rice Flour, Semolina, Ginger paste and salt. Grind all these ingredients in food processor / Mixer. Add green Chillies, Coriander, coconut, Cumin seeds, Curry Leaves and Onion. Add 2 tbsp. water, mix all the ingredients and prepare dough for Medu Vada. Add 1 tsp. water in soda, mix well and add in dough. Mix well and keep the dough aside for 5 minutes. After 5 minutes, apply some oil in your palm and prepare medium size balls from the dough. Deep fry MeduVada in oil over medium heat till crisp and golden brown on both the sides. Serve hot Instant Bread Medu Vada with Coconut Chutney.